This is a guest post from Jeff Hurt, the presenter of our free webinar “How to Turn Your Events into a Growth Engine for your Organization,” which was part of Wild Apricot’s Membership Growth Online Summit 2017. Click here to get access to watch Jeff's webinar. You can make your conference the purple cow of all conference experiences. That is if you want to be seen as unique and different. So how do you do that? By creating conference experiences that help your participants think smarter! This means designing conference experiences that go full frontal! Going full frontal means engaging the frontal lobe of your brain. More than creating temporary wow, unique, novel events that are transactional. You want to create events, programs and services for your members that are transformational. Most conference experiences are passive. They deliver information and distribute content for listening and consumption. They engage low level cognitive skills that don’t require any thinking. And they fall short of engaging the frontal lobe—the command center—of our brain. People today are tired of passive experiences says sociologist Dr. Josh Packard. They want to participate, discuss, expound on, question, and think deeper about issues. They are tired of being lectured to and talked at. They want to relate conference topics to their life and work through active experiences. 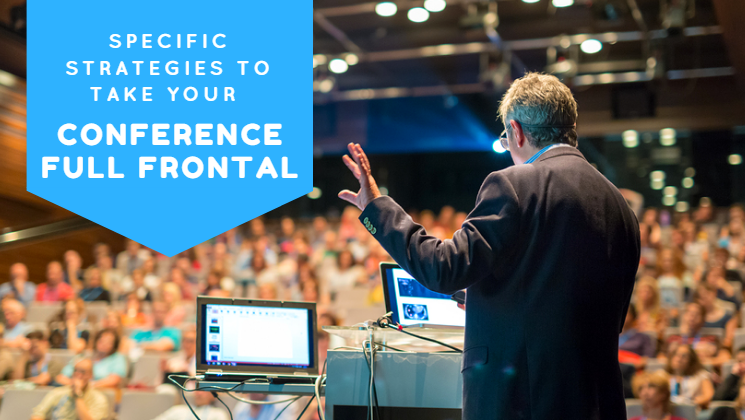 Here are a few tips to design conferences that maximize participants’ frontal lobes. Help your conference stakeholders wield one of their most powerful tools: metacognition. Metacognition is the ability to think about your own thoughts with an intention to improve your learning. Metacognitive practices help participants increase their ability to transfer and apply their conference learning to new contexts. They must know about these strategies and not just practice them. These meta-strategic thinking tools must be called out and identified so they can use them. Use pre-conference marketing tools to encourage participants to use metacognition for their own learning. Arming participants with cognitive metacognition tools can help them drive their brains to their own destiny. Helping conference stakeholders engage in metacognition is the gift that keeps on giving! When was the last time you had a major change in your conference experience? Not just the changing of the speakers and topics like the changing of the guard. Something more than that. If your conference has been doing the same thing, the same way, with the same speakers and the same audience for more than two–three years, dump some of those practices. Why? Boring, routine, predictable, repeat activities cause the brain to go on autopilot. When you are on autopilot, you are not mentally present. You check out and ignore activity in front of you. Instead, we must design conference experiences that foster curiosity, challenge status quo and create deep, effortful mental processing. Too much information freezes your brain’s dynamic frontal lobe capacity to engage in clear thinking and discerning decision-making, says Dr. Sandra Bond Chapman. Our brains get overwhelmed by too much information. And when we are in information overload, FOMO (Fear Of Missing Out) kicks in and we crave more information. Your frontal lobe becomes discombobulated. It becomes a vicious cycle: receive too much information-crave more-FOMO-shut down executive functions of brain-repeat. We’ve got to decrease the amount of information and content we share at conferences. We have to design programming that keeps key frontal lobe operations fine-tuned and focused. You can do this by asking speakers to reduce their content and spend 50% of their presentation time on audience participation, activities and higher order thinking skills. So many conferences provide programming to meet their internal certification requirements. People must attend specific sessions and recall specific content to pass a test to receive or maintain their designation. While memory is important, it appears to work independently of frontal lobe functions. It’s actually a low-level cognitive skill. When we create education sessions that go full frontal, participants become adept at transforming information to be recalled into bigger, better and original ideas says Chapman. In fact, trying to remember too many details actually counteracts the efficiency and effectiveness of frontal lobe thinking. So take your conference full frontal and implement some of these strategies! Invest in participant experiences that leverage cognitive command center for ingenious thinking! If you want to learn more specific strategies to help your conference stand out, please see my free webinar on “How to Turn Your Events into a Growth Engine for your Organization,” which was part of Wild Apricot’s Membership Growth Online Summit 2017. Jeff is a leading authority on meetings, adult education and conference design. He is Executive Vice President, Education and Engagement, at Velvet Chainsaw Consulting. In 2012, he was recognized as the PCMA Educator of the Year. Jeff has worked in leadership roles with five associations, five government organizations and several companies in the education, events and meetings departments, including Meetings Professionals International and Promotional Products Association International, one of the top 50 shows in the industry. He speaks and blogs frequently about meeting and technology trends, the future of conference education, adult learning and all things meetings at velvetchainsaw.com.